Without question this is the most popular mini-bottle of Vermont maple syrup. It makes an ideal, and quite affordable corporate gift item. Filled with 100% pure and natural Vermont maple syrup, the bottle is tide with a stylish ribbon and tag. We fill each leaf nip bottle with 1.7 oz. 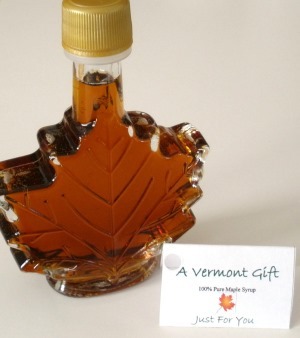 (50 ml) of our most popular Vermont maple syrup flavor, Grade A Medium Amber. Grade A Medium Amber maple syrup offers the most robust maple flavor of all the Vermont maple syrup grades, and it's delicious! This pure maple syrup is produced right here in northern Vermont. The Ribbon & Custom Tag - This syrup bottle is wrapped with a 3/8" wide green ribbon and includes our custom tag, on which is printed, "A Vermont Gift. Just For You." Other ribbon colors are available, simply give us a call. There's an orange maple leaf printed on the front as well. Inside the tag we'll also carefully hand-write your gift message.